Simon, Alex, George and Sorcha set off for Sunny Scotland. But everything including the kitchen sink proves too much even for the cavernous Bongo, so urgent trailer mods are required. 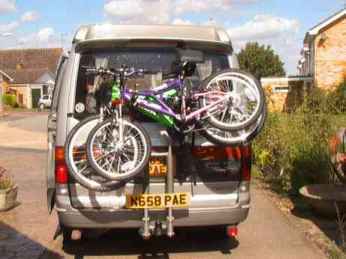 Plus buggering about with bike racks, and how to keep the kids quiet on a Bongo budget. So there we were, all ready to go to Scotland in order to offer ourselves up to the Northern rain-gods for the annual sacrifice. This is only the second time camping in our Bongo, the dry-run (ha-ha) being the Stourport Bongo-Bash where low overnight temperatures have convinced the missus that we would need all the duvets this time round. Now we have a problem: no matter how you squash and squeeze, duvet compression is impossible. This short of space we have two options; we can either consider our tog rating again, or leave the kids at home. Clearly neither will happen, so I am forced to press into service both our small camping trailer and the old top-box bought originally for our old Volvo. By fitting the top-box onto the trailer by means of screwing a sheet of 12mm external ply onto the trailer, and attaching the top-box to that, I now have somewhere for the awning, cooking gear, and clothes. The trailer has a drop-down tailgate, so I can slide stuff in there, including the (often soaking) awning and the gas bottle/cooker with the lid on. The clothes go into the top-box, which is a modified Halfords model. All that was required was to saw-off the bars which normally attach to the gutter so they fitted the width of the trailer, and bolt them to the new lid. Keep the bolts short so they do not protrude too far into the trailer space to avoid catching stuff. I used right-angled brackets to hold the top down with weather-strip in-between the top and trailer to keep rain out. Ideally, I would have hinged the lot so that it hinged up from the back, but I did not have time to do this. With my silver Bongo, the whole lot even matches for colour and design! But I also wanted to take the kids’ bikes, and found most of the solutions for bike racks on the club site to be either too expensive or unsatisfactory for trailer towing. So I had a look at the Halfords site and found their towball-attached carrier for £80.00. This does fit the Bongo, but requires some modification to the tow-ball by means of spacers. These are readily available from motorist’s centres or Halfords themselves. I used a half-inch and one-inch spacer as shown, and four-inch bolts. Torqued-up good and tight, with shake-proof washers on the nuts, they have not moved in three thousand miles. The straps as shown (to keep the whole thing tight and stable) are not as supplied as I took them off of an old cycle carrier I junked. The straps which do come with the carrier will attach to the rearmost upper seatbelt anchor and feed through the tailgate seal with no problem, but this makes it fiddly to close the tailgate keeping the straps on the outside, so I went this way instead. Either way works well. You will need to undo the bolt allowing the handlebars on the bikes to move and rotate them 90 degrees. OK, so keeping them occupied whilst we struggle with the awning upon arrival sorted, so what about silencing the ‘are we there yet?’ irritations? I found two solutions, both cheap, and both work well. The first is a small DVD player with 7″ screen from Tesco priced at just £80.00. It is designed to hang from the front seats, comes with two headphone outputs, and a remote control, and will run from own internal rechargeable battery or 12v supply. The brand is Technika. This is much better than I imagined it would be, and very much a bargain, allowing the driver to listen to the radio whilst the kids watch their DVD without interference. Note that the 12v cord as supplied is too short to reach from the rear 12v socket. I am going to put another one in the centre console somewhere, sometime…. However, I have also been looking for a solution to plug my laptop into the sound system for a while. There are numerous reasons as to why I would want to do this: I have lots of my MP3 files on the laptop I like to listen to; I use my laptop for GPS navigation (this works really well with a USB GPS dongle and the excellent Navigator software all in at under £100.00) which has a voice to alert me to roundabouts etc; the laptop is a wide-screen and plays DVDs but I want better sound so we can all watch a film cuddled-up together in the Bongo of an evening (especially when its pouring with rain as in Scotland). There are lots of expensive solutions to this, and there is one cheap one, which is, of course, the one I went for. This is simply a low-power FM transmitter, of which there are numerous examples, but I got the Belkin Tunecast II because it is a name I recognise and had the features I was after. I got mine from an eBay trader for £8.98 (but watch the P&P). All-in for around £20.00, and it works really well. Interestingly, although 15.4″ widescreen laptops were not available when my Bongo was built, Mazda clearly had them in mind as the space between the front seats is an exact size match, and the laptop sits comfortably on top of the console thingy either way around – facing front for navigation and music, and rear for playing DVDs. The seats stop the unit from sliding about and only determined acceleration will shift it (unlikely in a Bongo J). The laptop is kept charged by a universal 12v step-up laptop charger available from lots of places including Keene electronics, from whence mine originated. Incidentally, GPS is an absolute must in order to solve that other holiday irritation, the fundamental and hard-wired inability of any woman to read a map successfully in any orientation and any reasonable time-frame! Of course that’s not true, I only put that in there to irritate half the membership (the wife told me to say that, and also to add that it wouldn’t be so bad if I could just bring myself to stop and ask….). But it honestly does help to smooth the way! To sum up, a successful set of cheap but effective solutions, all tried-and-tested.